Ald. 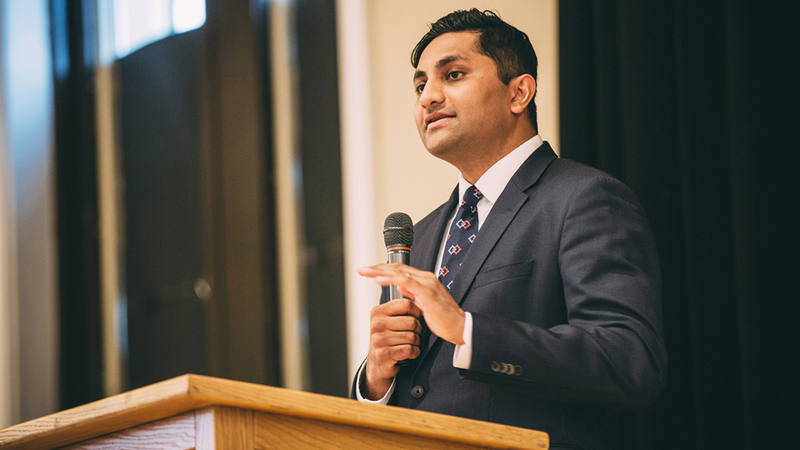 Ameya Pawar (47th Ward) may not be the most recognizable or well-funded candidate for Illinois governor, but that didn’t stop the 36-year-old from being the first Democrat to officially announce his campaign to unseat Gov. Bruce Rauner in 2018. Soon after his announcement, a spokesman for the Illinois Republican Party released a statement calling Pawar an “out-of-touch, tax-hiking politician,” linking him to longtime Illinois House Speaker Michael Madigan, an influential Democrat and frequent target for Illinois Republicans. But Pawar is fighting back, saying Rauner is neglecting to do his job. Rauner, a billionaire who made a whopping $50 million contribution into his campaign fund last December, isn’t the only deep-pocketed competition Pawar is up against this election. Businessman Chris Kennedy, a member of the Kennedy political dynasty, contributed $250,100 toward his campaign on March 24, lifting the election’s donation limits. Billionaire and entrepreneur J.B. Pritzker hasn’t officially declared a run for governor, but he did contribute $200,000 toward an exploratory committee on March 14. Pawar said his campaign fund currently stands at about $300,000. That’s from 1,000 donors across the state. But Pawar says he isn’t worried about money. Pawar, who previously worked at Northwestern University’s Office of Emergency Management, filled an open seat in City Council in 2011. Despite his relatively low profile in the governor’s race, Pawar’s constituents demonstrated their support for him in 2015 when he won re-election, garnering more than 80 percent of the votes. Pawar is now showcasing his plans for the governor’s office through a series of speaking tours focused on issues central to his platform: public education, universal childcare, new jobs and criminal justice reform. He says his progressive platform is based on President Franklin D. Roosevelt’s New Deal—a program noted for developing social security and public works projects to pull the country out of the Great Depression. The New Deal also means building coalitions of people across the state, said Pawar, who is visiting both red and blue parts of Illinois. Illinois’ gubernatorial primary will take place on March 20, 2018. This is the first in a series of conversation we will be having with declared candidates for Illinois governor. We will introduce you to some of the other candidates in the coming weeks. March 27: The primary for governor is a year away. But already, it's quite a contest. Limits on campaign contributions have been lifted. And this morning, six potential candidates made their pitches to Cook County Democratic committeemen. March 20: Casting himself as a progressive alternative to affluent candidates, state Sen. Daniel Biss has entered the race for Illinois governor. Feb. 8: A new official entrant – with a familiar name – in the race for governor. Why Chris Kennedy says he’s in it to win it this time.